Another Huge Quarter for Data Center REITs: What's Next? The challenge moving forward for data center REITs will be turning the uncertainty confronting customers into signed leases. Data center REIT shares spiked 19 percent during the first three months of 2016, buoyed by record leasing results that fueled high investor expectations. Subsequent to the end of the quarter, all six data center REITs continued to trade at new 52-week highs, including Equinix and Digital Realty Trust. Despite having significant UK and European data center operations, and recent large European acquisitions, both Equinix and Digital have proven to be "Brexit-resistant." This is in stark contrast to the negative post-referendum view of REITs and funds which own traditional office, retail, and industrial real estate located in the UK. Will the Cloud Land Grab Continue? The record leasing during Q4 2015 and Q1 2016 was driven in large part by unprecedented demand by the hyperscale cloud providers. After Q1 2016, North American Data Centers (NADA) published a report which highlighted how large cloud service providers drove leasing success for data center REITs in major markets. The question on the minds of most investors and many data center executives is: What will a normalized leasing picture look like? However, trying to read the tea leaves to determine the "new normal" has been complicated by the uncertainty following the Brexit vote. Issues such as: data portability, work permits for IT personnel, and vendor and supplier relationships have the potential of complicating the picture. Investors also must consider a hotly contested US presidential election which may put existing trade agreements at risk. This may lead many corporations to delay or curtail CapEx spending during the second half of the year. However, a potential silver lining for data center REITS might be the desirability of third-party cloud solutions which offer flexible pricing plans and are considered to be operating expenses. 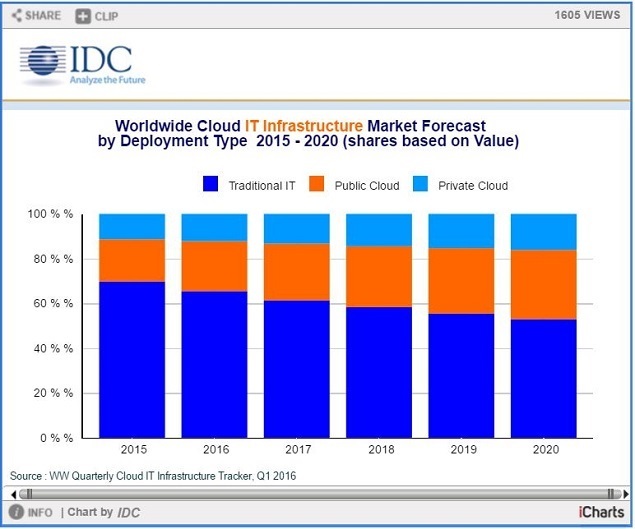 The IT spending trends forecast by IDC continue to favor public and private cloud deployments, and recent headlines appear to be providing more fuel for that fire. The challenge for data center REITs will be turning the uncertainty confronting customers into signed leases. As a practical matter, the upcoming Q2 earnings release and conference calls will be the last time to revise guidance or update investors on leasing that will impact full-year 2016 earnings. Data center REITs with existing shell space available for expansion are able to deliver space in a matter of months, offering a just-in-time solution for CIOs. Therefore, new lease signings announced during the second quarter of 2016 can still boost results for the second half of the year. Another impact of the cloud land grab being felt in many markets is a lack of inventory for large-scale deployments. This has created a pipeline of build-to-suits on a scale that is unprecedented. Build-to-suits give data center landlords earnings visibility that can result in analysts raising earnings estimates for 2017 and beyond. A large build-to-suit requirement can also help seed new phases of existing campuses, as well as provide a catalyst to expand into new geographic markets to serve existing clients. NADC's Jim Kerrigan has just released the July 2016 leasing report, which highlights how Microsoft and Oracle are continuing the momentum of hyperscale public cloud providers in the large Northern Virginia data center market. Things are heating in up in Chicago for the second half of 2016, with the July opening of the QTS campus in a market that has been supply-constrained. According to Kerrigan's report, Microsoft may be looking at the Chicago market for an extremely large deployment as well. When it comes to investing, although the trend is your friend, there is no time to rest on your laurels. If the cloud leasing momentum were to slow, data center REIT price momentum would likely falter as well. One nice artifact from the burst of cloud data center leasing during the past two quarters is the visibility of booked-not-billed space which will be delivered in coming months. However, given the huge run-up in data center REIT shares during the first half of 2016, this good news is baked into prices continually flirting with all-time highs. Investors and analysts will be eagerly listening to upcoming earnings calls for clues regarding lease signings and other catalysts not currently reflected in earnings models. Despite all the recent success, management will be under pressure to answer to the age-old question: What have you done lately?